Start off your visit on the 1st (Fri): don't miss a visit to Tanah Lot Temple and then enjoy the sand and surf at Pantai Sanur. On the 2nd (Sat), you'll have a packed day of sightseeing: identify plant and animal life at Sacred Monkey Forest Sanctuary and then relax and rejuvenate at some of the top local wellness centers. To find where to stay, maps, traveler tips, and tourist information, go to the Denpasar trip itinerary planning tool . Newark, USA to Denpasar is an approximately 29-hour flight. The time zone difference when traveling from Newark to Denpasar is 13 hours. Traveling from Newark in March, things will get warmer in Denpasar: highs are around 88°F and lows about 77°F. Finish your sightseeing early on the 2nd (Sat) to allow enough time to travel to New Delhi. Start off your visit on the 3rd (Sun): take in panoramic vistas at Qutub Minar, then take in nature's colorful creations at Humayun's Tomb, then steep yourself in history at Gurudwara Bangla Sahib, and finally stop by Craft House. 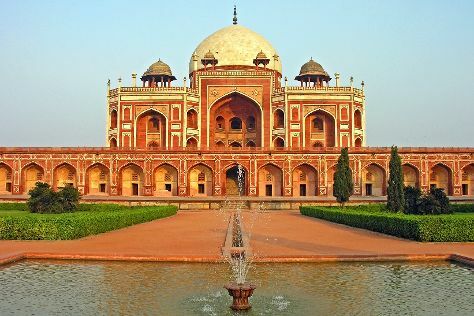 To find traveler tips, other places to visit, where to stay, and tourist information, go to the New Delhi trip builder tool . You can fly from Denpasar to New Delhi in 12.5 hours. The time zone difference when traveling from Denpasar to New Delhi is minus 2 hours. Traveling from Denpasar in March, expect a bit cooler with lows of 60°F in New Delhi. You will have some time to spend on the 4th (Mon) before leaving for home.